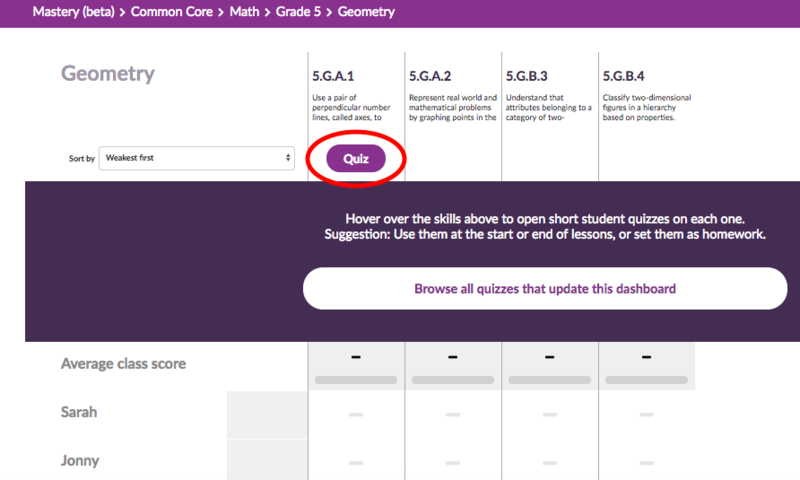 This article explains how you can tag quizzes with standards based skills (or curriculum based learning objectives), so that when students take your quiz their results automatically populate the Mastery dashboard. When you create a quiz like this it will also be available for any other teacher to use with the Mastery dashboard. Note: at present you can only tag completely new quizzes with a skill, you can't tag a quiz that you have created previously. We are working on making it possible to tag your old quizzes with skills. 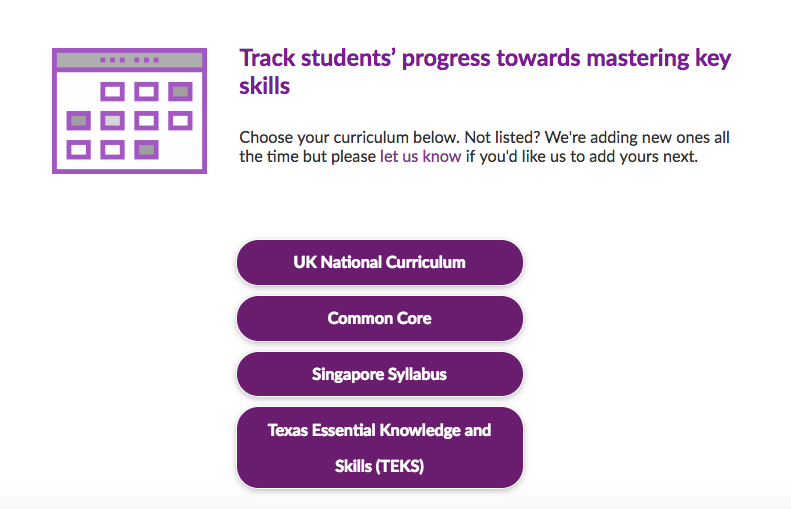 Our Mastery dashboard aims to gives you an up-to-date measure of each student's current level of mastery for each skill within your standard. It lets you to keep track of each student's improving mastery of both skills you have taught in the past as well as the new skills you are teaching today. For example, you can easily spot students who still have not mastered past learning objectives and you can then give them personalised work to help them achieve mastery. If you then requiz them, the Mastery dashboard will automatically update with their new results. Click on your standard/curriculum (Standard not listed? We are adding new ones all the time so please contact us). Quizzes already tagged to this skill will appear for you to use (as shown below). You will now find yourself in the Quizalize quiz editor where you can create your quiz. When you save this quiz it will be tagged with the skill and will then appear as a new quiz in the list of quizzes for this skill that you and other teachers can use it. Note: Only student results for new quizzes created and tagged with a skill using the process above will appear in the Mastery dashboard. 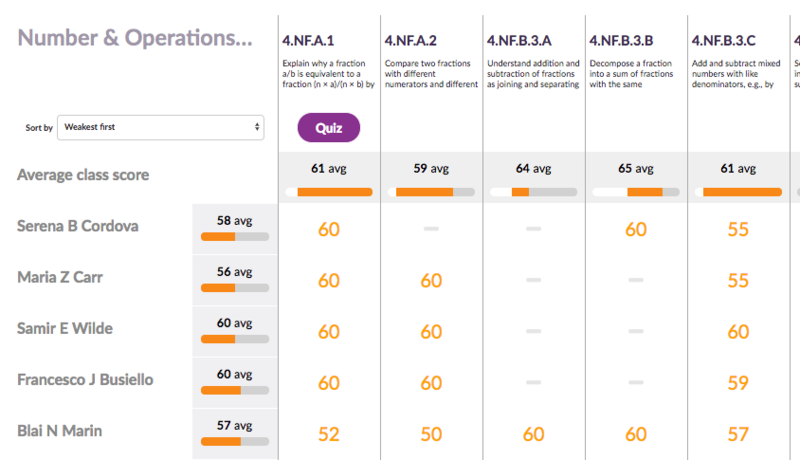 Once quizzes have been tagged to a skill your students' results will populate the Mastery dashboard in the column for that skill (as shown below) as well as in all the standard Zzish activity dashboards. The number of students who have "mastered", are "almost there", "needs help" with and "has not taken" each skill represented graphically in the bar at the top of each column. Whole class average score for the skill. You can use the bars at the top and left to quickly scan through and see skills and students that need your attention most. To find out more about the data provided by the Mastery dashboard click here. By tagging quizzes to your standard/curriculum in the Mastery dashboard you can track your students' progress more efficiently as well as share quizzes with other teachers in your area easily.